Home Pro Exteriors, Inc. is a top rated exterior remodeling contractor proudly serving Orange County New York and the surrounding counties. Our services include roofing, siding, doors, windows, decks, patio rooms and more! We are a customer-centric business and our philosophy revolves around providing an exceptional customer experience while providing a first rate project/installation. All of our services are paired with industry leading warranties by pairing ourselves with the very best material providers. We are proud to hold accreditation as A MasterElite roofing contractor through GAF as well as a 5 Star Select ShingleMaster with CertainTeed. As a Certified Installer and Platinum Level Dealer of Provia Products, we are proud to furnish their industry leading window and door products. 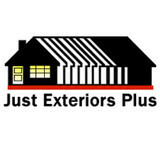 Just Exteriors Plus was founded in 1978 with one idea: Offer the absolute best products and service available, deliver more than promised—on time—be affordable and, most important, have fun at work. We are pleased that our idea is now reality. Watching a siding and window renovation progress from infancy to completion is a tremendous reward; seeing the smiles on our customers’ faces is the icing on the cake. 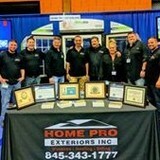 Since 1978, Just Exteriors Plus has grown to one of the largest siding and window companies in the Hudson Valley, serving upward of 800 customers a year. We're proud to be a lifelong resident of the Hudson Valley. Being a part of its development is truly a blessing. We'll keep our promises, return your calls and we will follow through. Expert Hardie Preferred Remodeler, siding specialists. We also do all phases of building and construction. Respectful staff, and meticulously clean job sites. Hire our dedicated team to enhance your home or business with vinyl siding. We'll gladly travel to your property throughout the Albany area and over 100 miles away. With 28 years of professional experience, local references are available upon request. Apple Siders was founded by Mark DeFalco in 1986. 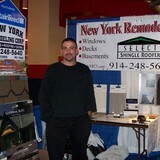 Mark has been providing home and commercial improvement services to customers for over 24 years. During this time he has honed his ability to guide his customers through the extensive selection of products and services that he offers in order to make their property improvement dreams a reality. With their knack for both new creations and existing rejuvinations, Apple Siders can handle any project. Be it roofing, siding, doors, windows, additions, framing, drywalling, kitchen installations, home additions, or decks - the Apple Siders crew will put in the time and finishing touches to perfect your project. When you need a home construction company that is dependable, affordable and friendly, turn to our expert team at Kingsbury Homes. 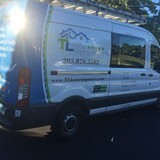 We can perform all the home remodeling services you desire in the greater southwest region of Connecticut and beyond. RH Brothers Builders is a siding and roofing contracting firm. We are committed to helping our customers and providing the highest quality product and services with low cost. We are happy to work with all of our customers and fit what best fits for them and any scheduling conflicts. No job is too big or too small! Call us today! A&M Contracting was formed because of our love of home renovations and the bond we create with our clients over the construction process. Our mantra is to always care for your client's home as your own. We are successful at nurturing the relationships with our clients so that they trust us to perform all aspects of construction now and in the future. Our client base is primarily repeat and referrals which is something we are very proud of. We continually become our clients first and only call when any renovations are needed to their primary and secondary residences. The siding of your home is a hugely important factor when it comes to first impressions; a damaged or mismatched exterior can cast a negative light over a property’s entire aesthetic! If you need new siding installed, or your exterior is in need of repair, repainting or replacing, a Hillside, NY siding and exterior contractor can help you out. What types of siding services do Hillside exterior contractors provide? Wood siding needs more maintenance than less-expensive, low-maintenance vinyl siding, but with proper care it will outlast vinyl siding, which can fade and crack over time. Your Hillside, NY contractor might also suggest fiber cement siding, which is fire resistant and termite-proof and can come with a warranty of up to 50 years. Find siding and exterior contractors in Hillside, NY on Houzz. Narrow your search in the Professionals section to Hillside, NY siding and exterior contractors. Find out how long a Hillside, NY exterior remodeling contractor has been in business, view portfolios, read reviews and get contact information.